Storm Clouds Gather West Of Elk. 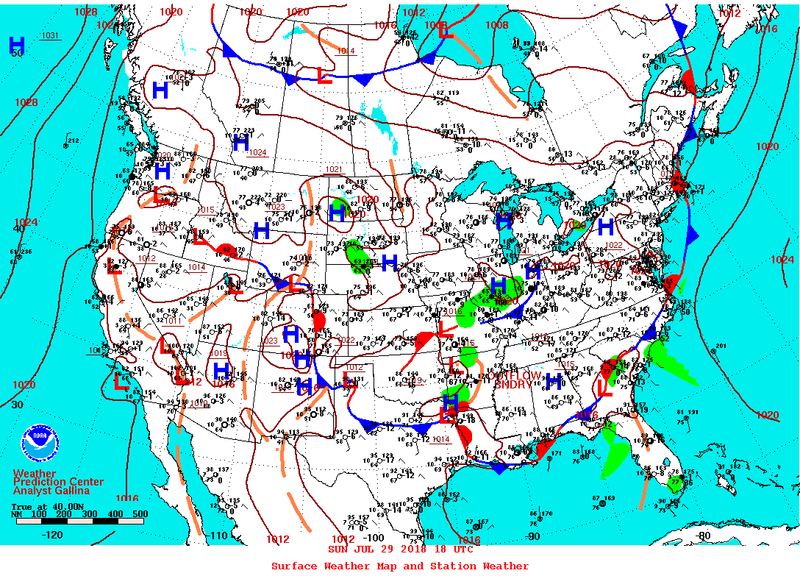 Cold Front Arrives Monday Afternoon. 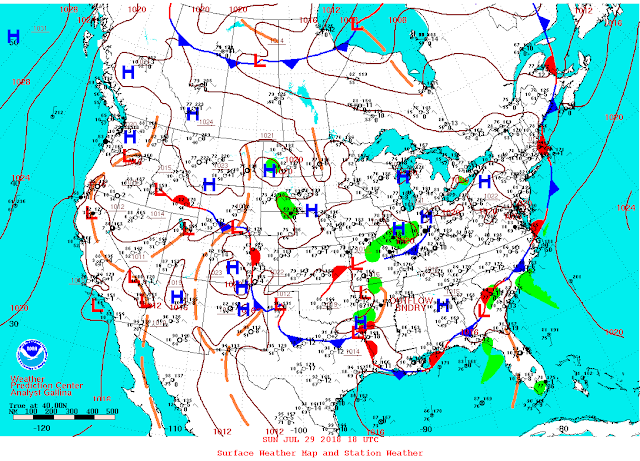 Cold Front Position At Noon MDT Sunday. At 4 PM MDT Sunday, July 29, 2018. 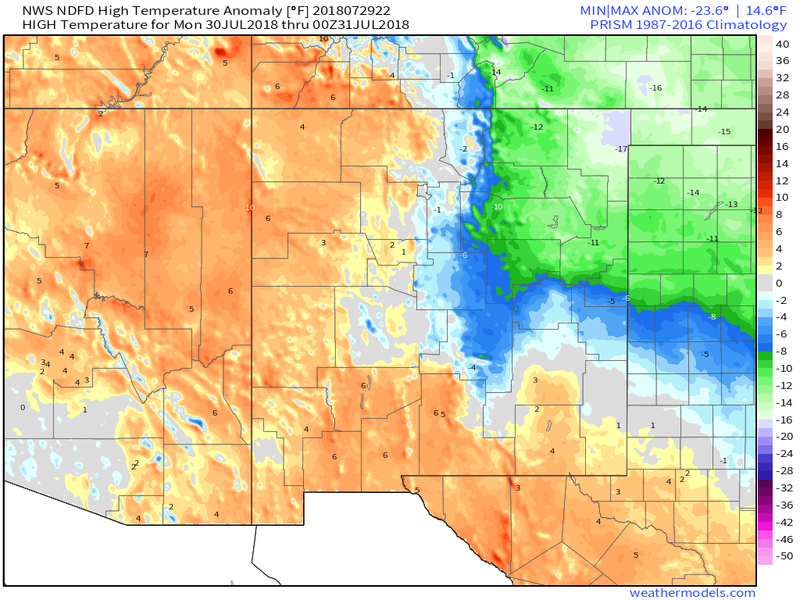 A rather robust (for this time of the year) cold front is scheduled to work its way southward down the eastern plains of New Mexico Monday afternoon. 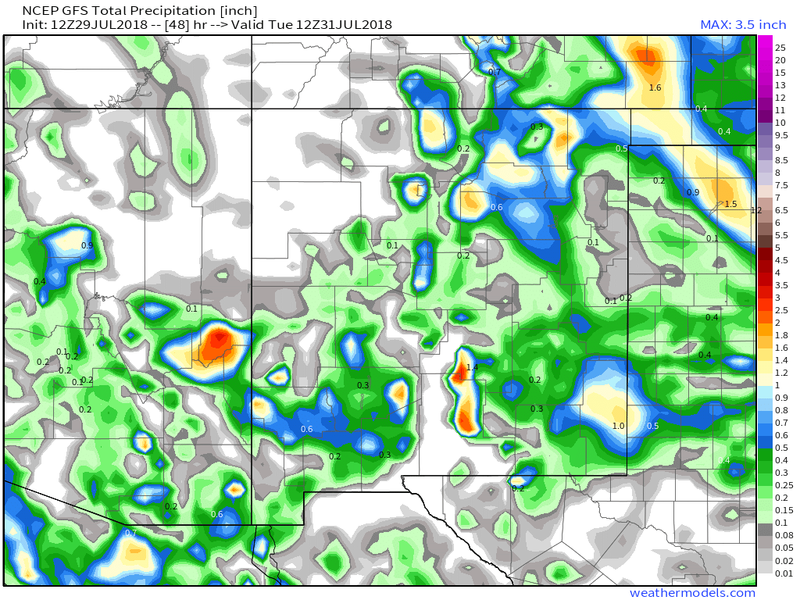 It will arrive in Southeastern New Mexico late Monday afternoon or early Monday evening. For a day anyway (Tuesday) we will get a temporary reprieve from the heat. Forecast high temps locally on Tuesday are slanted to be in the 80's verses the 102º I currently have at our home in Carlsbad as I write this. 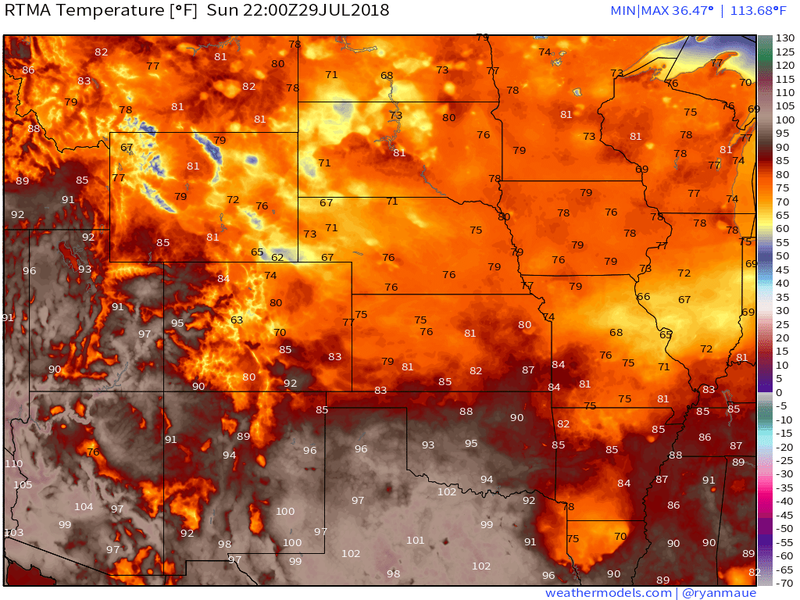 Note the temperatures across the high plains east of the Rockies at 4 pm this afternoon...the 70's and 80's. Our chances for thunderstorm will increase Monday afternoon and continue into Monday night and early Tuesday morning. Some of these initially may be severe and produce large hail, damaging thunderstorm wind gusts in excess of 60 mph, along with locally heavy rains and maybe localized flash flooding. 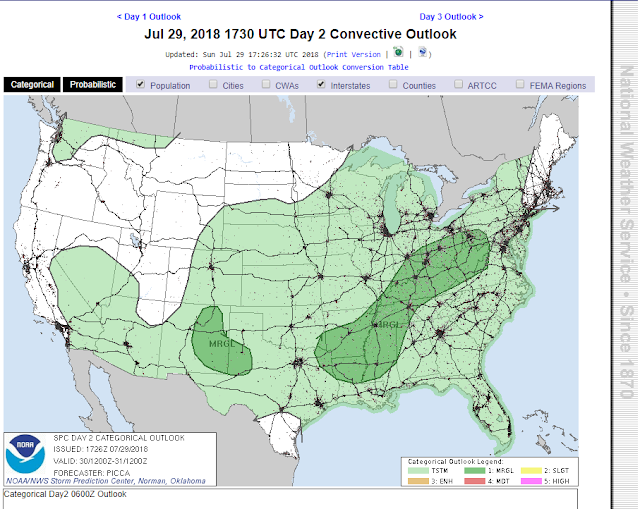 A few multicelluar and perhaps a few supercell thunderstorms (Marginal Risk Area) are forecast to develop over the local area Monday afternoon into early Monday evening according to the latest discussion from the Storm Prediction Center. 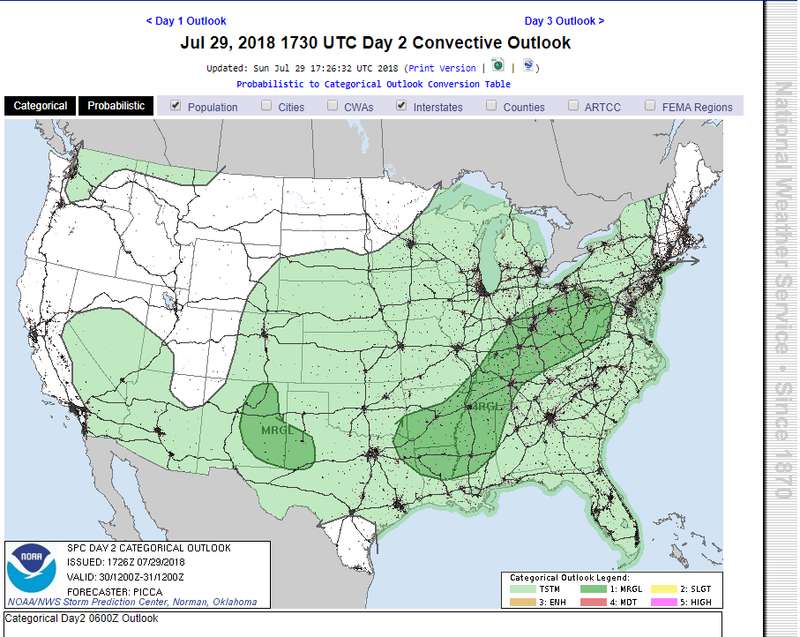 There is a chance that this outlook area could be upgraded to a Slight Risk Category on Monday...meaning that the risk for severe thunderstorms would be increasing. 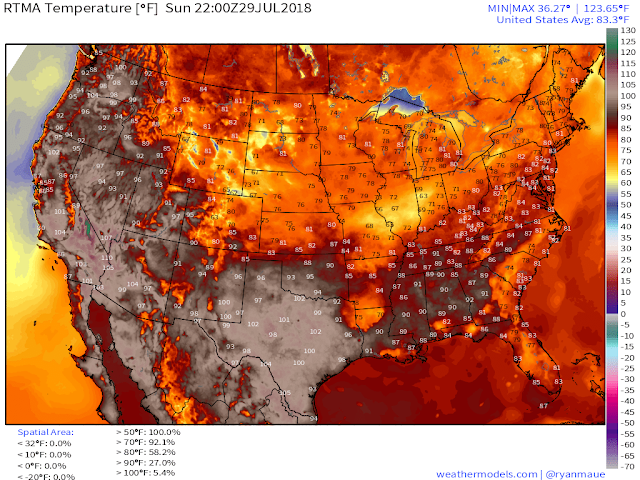 NWS NDFD High Temperature Forecast. 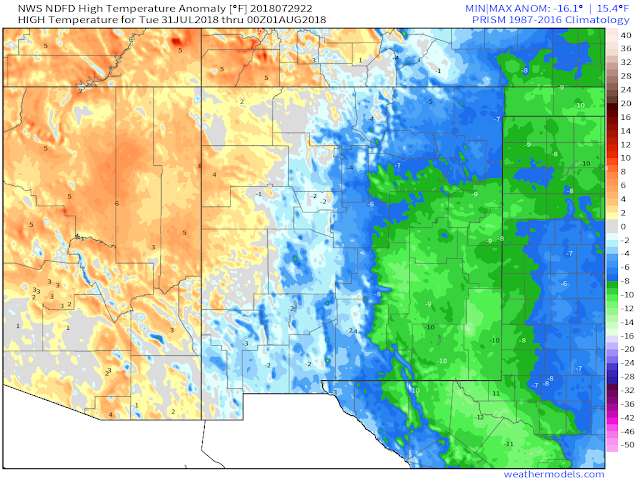 NWS NDFD High Temperature Anomaly Forecast. Temperatures ahead of the cold front Monday afternoon will still be hot across Southeastern New Mexico with highs forecast to be in the mid to upper 90's and perhaps a few spots close to 100º. 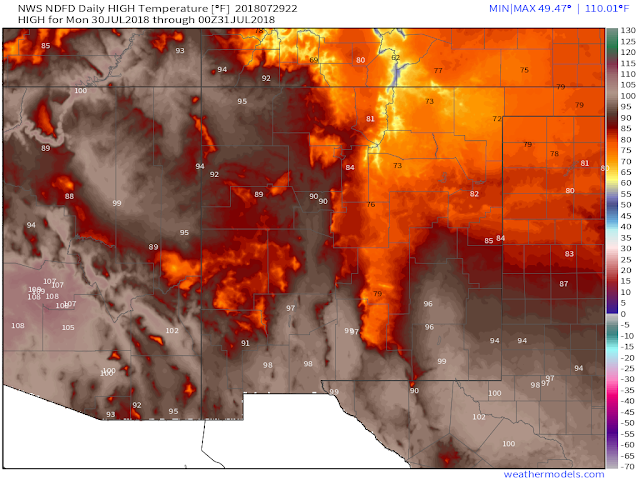 This compared with readings in the 70's across Northeastern New Mexico Monday afternoon. 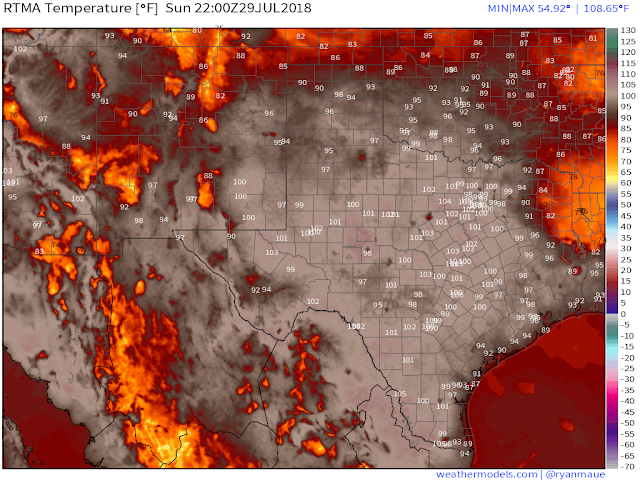 Our highs are forecast to only be in the 80's on Tuesday behind the cold front. Enjoy while it lasts because this time of the year it won't. 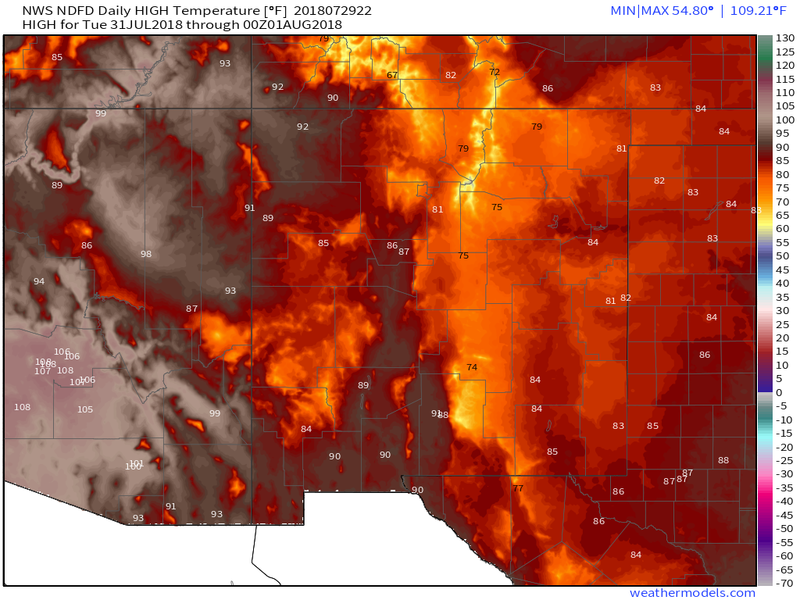 Valid At Noon MDT Wednesday. 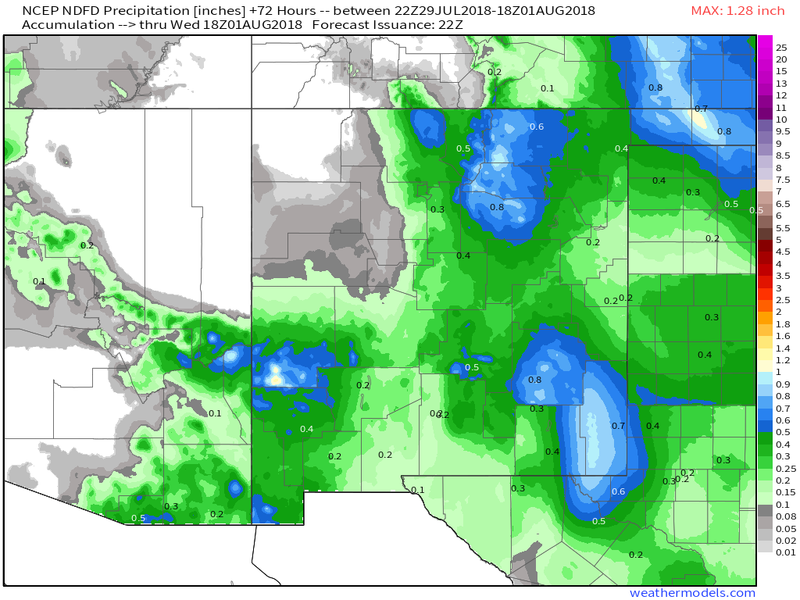 Locally heavy rains will be possible as the models are forecasting a complex of thunderstorms (MCS) to develop to our northwest and north and move southward into the area Monday afternoon into Monday night. If this scernario pans out thunderstorms could be ongoing over much of the local area Monday night into Tuesday morning. Rainfall totals associated with the stronger longer lived storms could end up in the 1" to 3" range. 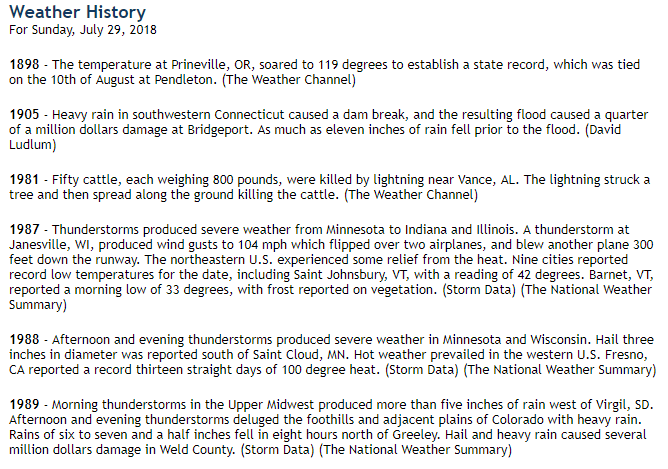 Weather In History - July 29th.